My personal favourite. There is nothing on this beach except sand! No bars, no take aways, no kiosks. You've got to go down around 100 steps to reach the beach, so that's why its always a little quieter. You'll find a kiosk on top, so buy your drinks before you go down. You can also safely park your car on the top, there will be a parking assistant, to whom you should tip between 25c and 50c. 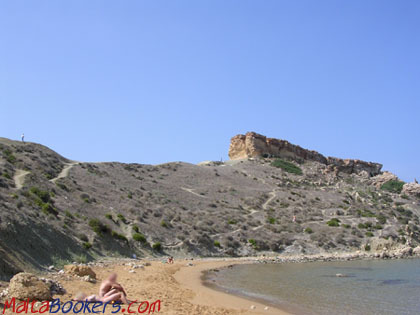 In Maltese, this beach is known as Ghajn Tuffieha, meaning the apple's eye. No idea why! We call it Riviera because once there was a hotel called The Riviera just above it. Its surrounded by nature on all sides and you can walk to some other smaller sandy beaches from here. The smaller ones are pretty popular with nudists. It's possible to walk to Gnejna Bay too, but it's not easy and I have never done it myself. If you can go down 100 steps, don't miss this beach. Getting there. Follow directions to Golden Bay from Xemxija. Riviera is 300m before Golden Bay. You can get to Riviera easily by bus, car and even bicycle. Bus no. 47 goes to Golden bay from Valletta while bus no 652 gets you there from Sliema. Facilities - Sun Beds, Umbrellas.